Scouting in West Midlands is about Scouting in the official region of West Midlands. It is largely represented by the Scout Association of the United Kingdom and some Groups of traditional Scouting including the Baden-Powell Scouts' Association. The Scout Association West Midlands Region covers the same area. The 5th Wolverhampton, 24th Birmingham/1st Sparkhill, 13th Stoke on Trent & Newcastle (1st Alsager), and 84th Birmingham (Somerset Road Methodist Wesleyan) Scout Groups claim to have started in 1908. The 9th World Scout Jamboree, celebrating the 50th Anniversary of Scouting was held at Sutton Park, Birmingham. There were 30,000 participants. It was combined with the 6th World Rover Moot with 3,500 participants and the 2nd World Scout Indaba. Birmingham Scout County is a Scout County of the Scout Association of the United Kingdom. It is concurrent with the City of Birmingham, and provides Scouting opportunities for young people and adults in the area. Muslim Scouts from Birmingham were among those from the UK on the first ever official trip to Mecca for the Hajj in January 2006. The first Muslim Scout Group in Birmingham was formed in 2005. The County has 98 Scout Groups and some Explorer Scout Units, grouped into Districts, providing Scouting for young people from the age of 6 and up. The County also manages the Scout Network, which is the programme section for 18-25 year olds, consists of a number of local Scout Networks. City of Coventry Scout County is a Scout County of the Scout Association of the United Kingdom. It is concurrent with the city of Coventry, and provides Scouting opportunities for young people and adults in the area. The Districts each divide into a number Scout Groups and Explorer Scout Units, providing Scouting for young people from the age of 6 and up. The County also manages the Scout Network, consisting of a number of Local Scout Networks, which is the programme section for 18-25 year olds. The Coventry Saracens Rugby Football Club was originally formed in 1966 from the 13th Coventry Scouts. The 13th City of Coventry Scout Marching Band was founded in 1929. Since then it has had 34 Royal performances, appearing in events and venues such as Westminster Abbey, Windsor Castle, St Paul's Cathedral, the Royal Tournament, Wembley Stadium, Royal Albert Hall, Royal Festival Hall, London's Guild Hall, The Lord Mayor's Show, Horse Guards Parade, Coventry Cathedral, the Spalding Flower Parade, London's Easter Parade, and the Jersey Battle of Flowers. They have been National Scout Supreme Champions nine times in ten years. Hereford and Worcester Scout County is a Scout County of the Scout Association in the United Kingdom, covering the counties of Herefordshire and Worcestershire. Shropshire Scout County is a part of the Scout Association in the United Kingdom, covering the County of Shropshire. The 100th anniversary of Scouting was celebrated in Shropshire on top of the Wrekin, near their County Camp Site, and in Ironbridge. Staffordshire Scout County is a Scout County of the Scout Association of the United Kingdom. It is concurrent with the political county of Staffordshire. Warwickshire Scout County is a Scout County of the Scout Association of the United Kingdom. It is concurrent with the political county of Warwickshire. Solihull Scout County is a Scout county of the Scout Association in the United Kingdom, and covers an area similar to the Metropolitan Borough of Solihull. The Halesowen Scout Band are a marching band from Halesowen in the West Midlands, England. They were formed in 1975 as a district Scout band, which means that their members are drawn up from different Scout groups throughout the Halesowen district. 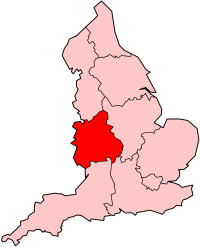 The Halesowen Scout district includes the Hasbury, 1st Halesowen, Coombes Wood, Lapal, Howley Grange, Romsley, Cradley, Stambermill and Wollescote scout groups. The band plays an important role in the community of Halesowen and surrounding areas which includes leading parades on Remembrance Sunday, St George's Day, Guides Thinking Day, opening of the Christmas lights, and various fêtes and carnivals throughout the year. They are members of TYMBA and compete in the National Class. They attend competitions throughout the year which are organised by other members of TYMBA (they also host a TYMBA contest themselves at the Earls High School, Halesowen). Over the past few years, the band has performed at venues in places such as France, Alton Towers, Wembley Stadium and Arena, the Black Country Living Museum, and at the Birmingham International Tattoo alongside the Grenadier Guards and The Royal Marines. In April 2007, the band, joined by members of Spen Valley and Northampton, played at the St Georges Day Parade at Windsor Castle and was reviewed by Her Majesty The Queen. Rough Close Outdoor Centre is the City of Coventry Scout Association County's campsite, located outside of the city of Coventry, about 1-mile (1.6 km) west of Tile Hill Village. The site offers a number of fields and pitches, allowing it to host anything from small patrol camps to County events. There are a number of buildings on the site, offering indoor accommodation and dining facilities, as well as some training facilities. The centre provides activities including archery, air rifle shooting, climbing, pioneering and orienteering. Roy Morris, President of the 4th Coventry Scout Group, who joined the Scout movement in 1942, was awarded the Silver Wolf Award, the highest award of the Scout Association, for raising £85,000 for Rough Close in 2008. The Hereford and Worcester Scout Association County Camping and Activity Centre is Kinver Scout Camp. Rhydd Covert is owned and run by Kidderminster District. The Malverns District own a campsite at Warren Oak. The site is 3 miles (5 km) NNW of the market town of Ledbury in Herefordshire, just east of the B4214. Wrekin Scout Camp, owned by the Shropshire Scout Association County, goes back to before 1951 when a Shropshire Rotary Club built a chapel on the site. Consall Scout Camp, situated between Leek and Cheadle. Beaudesert Park Scout & Guide Camp, operated by a registered charity, the Beaudesert Trust. It is situated on the edge of Cannock Chase. East Birmingham Gang Show. Spitfire Scout District runs an annual Gang Show at Sheldon Heath Community Arts College in Sheldon. ↑ "Solihull Scout Times - June 2006" (PDF). Solihull Scout Times. June 2006. http://www.solihullscoutcounty.org.uk/newsletters/newjune06.pdf. Retrieved 2007-08-28. This page was last edited on 6 May 2012, at 16:00.